TRIMOS’ height-gauges allow the dimentional measuring of all kinds of parts. They were developed with a vision for extreme conditions. More than 40 years of experience combine technological innovation and ergonomic design. Their robustness, durability and simplicity of use make them the ideal tools for daily use in the workshop. Horizontal Measuring Instruments (Laboratory)TRIMOS laboratory benches are used for the calibration of all dimensional measuring means as well as for high-precision measurements. The uncompromising design of these instruments is a reference in precision, efficiency and reliability matters in the most prestigious laboratories. This new range of instruments allow an ultra-precise and rapid measuring of surface textures. TRIMOS has been able to integrate the latest contactless measuring technologies while maintaining the traditional simplicity of use of the instruments. This is why they are particularly well adapted to modern manufacturing processes. 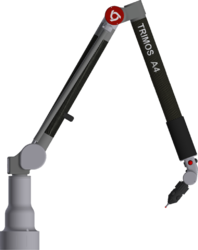 Trimos A-line portable articulated measuring arms allow an extremely easy and accurate 3D measurement. Thanks to an extremely stable carbon structure, all models are light and easy to operate. The A-line is ideal for quality control, inspection, or verification of small and large size parts. The Mini-Horizontal TELS is the ideal instrument for checking small dimensions. It is part of the horizontal instruments family. 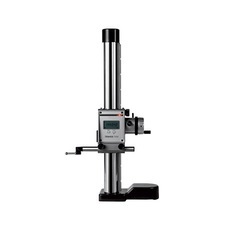 The instrument is mainly used for checking internal and external dimensions, such as ring gauges, plug gauges, thread plug gauges and for measuring precision production parts. The reliable concept is easily suitable for the use in workshop environment. An electronic probe and digital display unit or simply a dial indicator can be applied to perform all measurements. The selection of the measuring system depends on the required accuracy. The range for internal measurements from 10 to 100 mm and external measurements from 0 to 100 mm covers a large number of applications. The absolute measuring range is 25 mm and a preset setting is necessary to obtain an entire length. A wide range of accessories are available. The TVM instruments are perfect for height measurements and scribing work and reliable in all kinds of workshop conditions. The result of an unique, compact design of the instrument is great mobility and extreme stability. Because of its advanced measuring system, the self-contained working time of the TVM is one year. Therefore it can be used for multiple applications in the workshop area. The simplicity of manipulation allows constant change of the user without any time-consuming training. The success of the TVM among competitive gauges is outstanding. More than 14’000 instruments are in use worldwide. A large range of accessories for all kinds of measuring applications is available. The height gauge V3 have been developed for the most difficult workshop environments. Manufactured in their entirety in Switzerland, they will guarantee a robust, precise and reliable product on the long run. For more than 40 years Trimos philosophy has been to offer easy-to-use instruments that are very efficient in production environment. The display unit provides functions that are directly accessible and depicted with symbols easy to understand. The V3 measuring column represents the entry-level of Trimos universal measuring columns. It fully benefits from the developments realized on superior models. A robust and easy-to-use instrument including all functions essential for a use in the workshop.